Removable component which protects the carpet against exterior dirt. 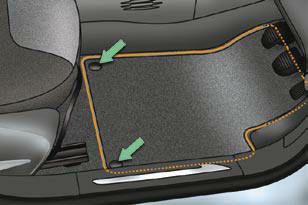 When fi tting the mat for the fi rst time, on the driver's side, use only the fi xings provided in the wallet attached. The other mats are simply placed on the carpet. position the mat correctly, refi t the fi xings by pressing, check that the mat is secured correctly. - never fi t one mat on top of another.